The Departments of Music and Theatre & Dance will present a showing of new works in progress on Monday, December 9th at 4 pm in Lippes Concert Hall (UB North Campus). Admission is free. Buffalo and Rochester area choreographers collaborated with PhD music composition students throughout the fall semester to create new works in a course collaboratively taught by SUNY Distinguished Professor and Birge-Cary Chair, Dr. David Felder and Associate Professor of Dance, Melanie Aceto. This course is a new venture between the dance program and the music composition seminar MUS 627. Rochester choreographers include Heather Roffe and William Evans. Buffalo choreographers include Melanie Aceto, April Biggs, Anne Burnidge, Nancy Hughes and Kerry Ring. Composers include Christopher Ashbaugh, Weijun Chen, Esin Gunduz, Clinton Haycraft, Dimitar Pentchev, David Rappenecker and Matt Sergant. It has been a very exciting dialog and rewarding realization of these unique pieces. Movement is virtuosic to pedestrian and incorporates set and prop. Sound compositions span vocals, amplified rocks on wood, piano, electronics, marimba and vibraphone. We hope you will join us for an afternoon of dance, live music and an exhibition of the collaborative process. Financial support for this project comes from the Robert and Carol Morris Center for 21st Century Music and the Birge-Cary Chair in Music, with additional funding from the Chair of Theatre & Dance. Contact Melanie Aceto (aceto@buffalo.edu) for more information. 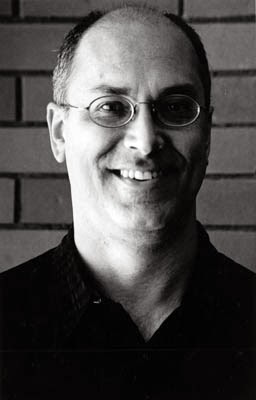 The Robert and Carol Morris Center for 21st Century Music is very happy to announce: A Musical Feast, 60th birthday concert for SUNY Distinguished Birge-Cary Professor in Music Composition, Dr. David Felder. The gala will take place at 8 pm on Friday, November 8 in the Peter and Elizabeth C. Tower Auditorium of the Burchfield Penney Art Center, 1300 Elmwood Avenue, Buffalo. Please join us for an evening of Felderian splendor, and help us launch David into his seventh earthly decade! A Musical Feast and The Center for 21st Century Music extend a heartfelt thanks to the Burchfield Penney Art Center's associate director Don Metz and lighting/sound engineer John Malinowski, and technical director of the UB Department of Music's Chris Jacobs for their all their help. Also many thanks to M+T Bank , videographer Marty McGee, and Holiday Inn/Hart Hotels, Inc. for their generous support. Special thanks to Dr. JT Rinker. Another Face was written in 1987 for the violinist Janos Negyesy and was commissioned by the National Endowment for the Arts. The work is the second piece composed in the “Crossfire” series of four works, some with electronics and optional video wall projection. Another Face is a musical ‘response’ to the extraordinary novel by the great Japanese writer Kobo Abe, “The Face of Another”. Abe has created a set of circumstances in his novel that confront us with profound questions concerning identity; these prompted a composition which proposes small musical modules juxtaposed in coded sequences as the small building blocks contained within extended lines. Each of the small modules consists of a pair—two pitches, and two distinct rhythmic values, which are repeated locally (for memory’s sake), and transformed formally through four passes through the sequence. And yet...the entire focus of the work is the emergence during the unfolding of the piece of an unnamed ‘third force’, a certain lyrical something that is contained within the somewhat more fiercely deterministic materials. The transformed reconciling materials appear very prominently at the end of the work. The work is a fiendishly difficult virtuoso piece and without the work, spirit and dedication of such virtuosi as Janos Negyesy, Karen Bentley, and Movses Pogossian, it would not have been possible to compose it. Thus it is dedicated to them with all admiration and gratitude. Luckily, violinist Yuki Numata Resnick, one of the UB Music Department’s new faculty members, has already proved that she has the chops to make the most challenging music come to life. Like a versatile athlete who can play more than one position in a game, the percussion soloist in TweenerB fulfills many roles, and, in the course of the piece, goes from being a team member of the ensemble to becoming the featured protagonist. The relationship between soloist and group is volatile and constantly changing in this one-movement work: the soloist may be seen as a “catalyst,” igniting musical processes within the group. and also as a “mediator,” engaging in an ongoing “give-and-take” with his recorded image. Either way, the basic idea of the piece is the energetic exchange and metamorphosis of communication, but it is a communication of a mercurial sort, taking many unpredictable turns as it unfolds. Yet this is not the only sense in which this work is a true “tweener:” it moves between the extremes of simplicity and complexity, in terms of both instrumental technique and musical structure. Instrumentally, the soloist can play simple pairs of notes on the marimba, alternating between left and right mallets, or highly involved passages with two mallets in each hand. Structurally as well, TweenerB alternates between two states of mind: it is part mysterious and introverted, part energetic and full of drama. In the course of the sixteen-minute work, two large cycles of slow-fast are completed, with many subtle nuances of speed within each basic tempo. The piece was originally written for solo percussion, orchestra and electronics. TweenerB is a different version of the work where the soloist is joined only by electronics. The soloist uses a KAT mallet controller system—an electronic percussion instrument triggering a computer. The piece opens with what seems primeval “mist,” out of which a number of short motifs gradually emerge, each centering around a certain interval such as a second, a third, a tritone or a seventh. It is striking that, if the motif consists of three notes, the middle note is often emphasized either by dynamics, by rhythmic elongation, or by a melodic leap, in another manifestation of the “tweener” idea. The first fast tempo, marked “Dramatic,” arrives suddenly with insistent ostinatos leading into a brief jazzy passage marked “Sardonic.” The next section, “Lava-like,” introduces some fundamental types of motion in the piece, first spreading material inexorably in a linear (horizontal) fashion, and later erupting like a volcano in a “hyper-aggressive” outburst. But then the tempo slows down again (“Lyric”); it is as though the music were succumbing to intense gravity and passing through a “black hole” into another dimension before the piece enters another high-energy phase. There is a cadenza where the soloist is instructed to improvise freely using materials suggested by the composer. The final measures see a last explosion of energy—a musical “exhalation,” as it were, where the soloist comes across somewhat like an Olympic running champion who winds down his gallop around the arena after passing the finish line. Special thanks to JT Rinker and Matt Sargent for their work on the electronics and mixing, and to Jon Nelson, Tom Kolor, Eric Huebner, Ben Herrington, Adam Unswurth, Jim Daniels, Tony Marino, and Zane Merritt for their contributions! November Sky was composed in 1990-92 for flutist Rachel Rudich. The work is the third in the “Crossfire” series, but the last composed, in the series of works featuring a virtuoso soloist and his (or her) electronically altered image. In this work, NeXT computers were used to process a huge library of archetypal flute materials made by the soloist and to create the four channels of computer-processed flute sounds. The acoustic flute is the sole source. All of the musical materials were derived from a single melodic line that is played about halfway through the piece. The large-scale form is roughly articulated by four sections approximately coordinated with the changes of instrument from piccolo through bass flute. Each section offers increasingly reflective and distant perspectives on the musical material in the manner of ever-deepening meditation. The title refers obliquely to the psychologically shifting perspectives that accompany seasonal change; particularly the affect surrounding the inexorably failing light as fall gives way to winter. The work was commissioned by the National Endowment for the Arts. Rick Bidlack and Scott Thomas assisted the composer in the realization of the computer portion of the work. Flutist Emi Ferguson, another new UB faculty member, will perform November Sky, a work that utilizes solo flute, doubling piccolo, alto and bass flutes and the soloists’ electronically altered sounds. The composer writes, “The title refers obliquely to the psychologically shifting perspectives that accompany seasonal change; particularly the affect surrounding the inexorably failing light as fall gives way to winter. BoxMan was composed for trombonist Miles Anderson originally in 1985-87 and was commissioned by the National Endowment for the Arts, the Ars Electronica Festival in Linz, and the La Jolla Museum for Contemporary Art. It is the final work (but the first composed) in the composer’s “Crossfire” series of works for soloist and his electronic image in both audio and video domains. The work is inspired by Japanese novelist Kobo Abe’s novel “The Box Man”, wherein the lead character is a thoroughly disenfranchised and nameless street person, living out a bizarre existence in a wholly alienating urban environment (Tokyo, circa 1960). Musically speaking, five types of “behavior” were selected for the soloist: manic, threatening, introverted, aggressive, and lyrical, and these are juxtaposed throughout the work. On the technical level, all sounds are made by the performer; live, on the computer part, and through live electronic sound manipulation. The original electronics (outboard, stand-alone, rack-mounted, commercial ‘boxes’) were re-made, with programming by Erik Oña and David Kim-Boyle, with even more fixes and updates by Brett Masteller, and JT Rinker from 1999-2004, utilizing MAX/MSP and Macintosh machines to replace the outdated outboard signal processing boxes. The ‘vintage’ quality of that older processing is deliberately retained with limited elaboration made in MSP. BoxMan is a fiercely virtuosic piece challenging the performer in every way imaginable--technically, (range, speed, articulation, dynamics, endurance, synchronization with live and pre-recorded electronics, etc. ), and perhaps more importantly, expressively. Bass Ethan Herschenfeld, who offered an outstanding interpretation of these texts in the earlier version, returns for this performance. These three songs incorporate poems that present complementary images of the times of day; particularly dusk, the deep middle of the night, and early morning. Thus, Felder used two poems by Robert Creeley (1926-2005) and one by Dana Gioia (b. 1950); the poems can also be heard, as read by the poets (and manipulated in various ways by the composer), in the electronic layer of the work. These are the three movements; we are going to hear the first two tonight, as a preview, and as a work-in-progress for the full premiere next May in Sweden. Shamayim began as a music work commissioned in three separate parts by various European festivals and the Project Isherwood, an initiative to create new works for bass singer Nicholas Isherwood. Commissioning funds were also provided by the Grame Center in France, the Argosy Fund for Contemporary Music, the New York State Music Fund, as well as the Birge-Cary Chair in Music, the UB2020 Scholar’s Fund, and the Morris Creative Arts Fund (image realization), all at the University at Buffalo. Isherwood’s unique talents and abilities were the primary sources for all of the sounds in the piece, with accompanying natural sounds and selected ringing metals. This work is designed to exist in three complementary versions: the first, is a conventional live performance, with image, in concert halls with live amplification, processing, and 8 channels of sound; the second, a version for installation, concert hall/large cinema with 8 channels, or thirdly, as a home theater presentation in surround 5.1 and with a specially prepared image presentation. The latter was commercially released in October, 2009 by Albany Records. Spatial distribution of musical elements is a critical component in the composition. The DVD/DTS may be played through a DVD multi-channel audio player by connecting the output to a surround receiver and a system that has a 5.1 setup as a prepared reduction of the original 8 channels. Felder composed his multi-media work Shamayim—the title refers to the Hebrew word for heavens—between 2006 and 2008 in collaboration with the noted independent American filmmaker Eliot Caplan, best known for his collaborations with John Cage and Merce Cunningham. Structural principles are derived from the letters of the Hebrew alphabet, letters that contain both a numeric value and imply a sense of movement and direction. The computer generated sound throughout draws on the virtuosity of the bass vocalist. Caplan’s accompanying video effectively makes use of images from nature, such as a lake, trees and clouds, along with video processed images of hexagons that mirror the abstract nature of the music. In June, 2013 Albany Records released a Blu-ray CD of music composed between 1979 and 2010 by Professor David Felder, University of Buffalo's esteemed Birge-Cary Chair in Music Composition. Performers include the Slee Sinfonietta Chamber Orchestra, June in Buffalo Festival Brass, and soloists Jean Kopperud, Tom Kolor, Stephen Gosling, Ian Pace, Mario Caroli, and Magnus Andersson. For audiophiles with a surround sound system, the Blu-ray CD features eleven pieces of glorious eight-channel audio. For the rest of us, a CD is included that contains the tracks that can be played back on a traditional stereo system. Hot tip: If you purchase Inner Sky, hie thyself to a top-notch surround sound system; your ears will thank you. 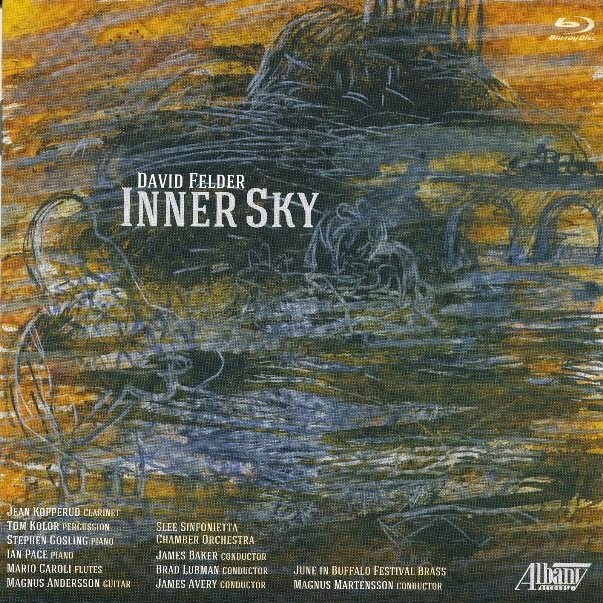 David Felder's music is perfect to demonstrate the capacities of Blu-ray audio. Musical climaxes feature piercingly fierce highs and rumbling lows. Elsewhere, shimmering diaphanous textures, frequently blending electronic and acoustic instruments, surround one immersively in this multi-channel environment. One of the magical things about Inner Sky, not just as a demonstration of an audio platform but as an expertly crafted composition, is the use of register to delineate the structuring of the three main facets of the piece: its solo part, the orchestra, and the electronics. Over the course of Inner Sky, flutist Mario Caroli is called upon to play four different flutes: piccolo, concert flute, alto flute, and bass flute. Moving from high to low, he negotiates these changes of instrument, and the challenging parts written for each of them, with mercurial speed and incisive brilliance. Even though all of the orchestra members are seated onstage, we are also treated to a spatialization of sorts through the frequent appearance of antiphonal passages. This ricochet effect is more than matched by the lithe quadraphonic electronic component. Featuring both morphed flute sounds and synthetic timbres that often respond to the orchestration, it is an equal partner in the proceedings. Tweener (2010) a piece for solo percussion, electronics, and ensemble, features Thomas Kolor as soloist. Kolor is called upon to do multiple instrument duty too, using "analog" percussion beaters as well as a KAT mallet controller. An astounding range of sounds are evoked: crystalline bells, bowed metallophones, electronically extended passages for vibraphone and marimba. The percussionist's exertions are responded to in kind by vigorous orchestra playing from University of Buffalo's Slee Sinfonietta Chamber Orchestra, conducted by James Baker. The Slee group flourishes here in powerful brass passages, avian wind writing, and soaring strings. The brass pieces Canzonne and Incendio are also played by UB musicians in equally impressive renditions. These works combine antiphonal writing with a persuasive post-tonal pitch language that also encompasses a plethora of glissandos. The Slee Sinfonietta again, this time conducted by James Avery, gets to go their own way on Dionysiacs. Featuring a flute sextet, the piece contains ominously sultry low register playing, offset by some tremendous soprano register pileups that more than once remind one of the more rambunctious moments in Ives's The Unanswered Question. What's more, the ensemble players get to employ auxiliary instruments such as nose whistles and ocarinas, adding to the chaotic ebullience of the work (entirely appropriate given its subject matter). Clarinetist Jean Kopperud and pianist Stephen Gosling are featured on Rare Air, a set of miniatures interspersed between the larger pieces. These works highlight both musicians' specialization in extended techniques and Kopperud's abundant theatricality as a performer. Pianist Ian Pace contributes the solo Rocket Summer. Filled with scores of colorful clusters set against rangy angular lines and punctuated by repeated notes and widely spaced sonorous harmonies, it is a taut and energetic piece worthy of inclusion on many pianists' programs. Requiescat (2010), performed by guitarist Magnus Andersson and the Slee Sinfonietta, again conducted by Baker, is another standout work. Harmonic series and held altissimo notes ring out from various parts of the ensemble, juxtaposed against delicate guitar arpeggiations and beautifully complex corruscating harmonies from other corners. Once again, Felder uses register and space wisely, keeping the orchestra out of the guitar's way while still giving them a great deal of interesting music to play. Written relatively recently, Requiescat's sense of pacing, filled with suspense and dramatic tension but less inexorable than the aforementioned concerti, demonstrates a different side of Felder's creativity, and suggests more efficacious surprises in store from him in the future. Tweener, a work for chamber orchestra with percussion solo. The percussion part is confined largely to the mallet instruments, the marimba and the KAT electronic mallet instrument (the latter a new one to me, to be sure). The work has its very busy and dissonant sections—imagine Varese on steroids—as well as sections of quiet repose, more akin to Feldman. Colors abound through imaginative scoring, and much of the work's unique sound comes through the use of instruments in their lower registers. Rather than consistently use the percussion in an overt soloistic fashion, Felder often integrates it into the texture, adding colors and textures to the effect of the ensemble. This is to take nothing away from the virtuosity of the percussion writing, or the considerable skill that percussionist Tom Kolor brings to it. The first of these is Rare Air: Blews for a length of garden hose off-stage and electronics. The hose part consists mainly of wailing on the part of the soloist, leading me to wonder how those sounds were produced on the clarinet (the attribution on the tray card), but at under two minutes, the piece does not wear out its welcome. The similarly-titled Rare Air: Boxmunsdottir actually utilizes clarinet and bass clarinet, as listed, along with electronics, but the tray card lists piano on both of these works, of which I heard not a note. It is nonetheless full of interesting effects and overlaying of the two solo instruments. There are some piano sounds in the later-heard Rare Air: Boxmunsson but nary a word in the notes explaining the use of the Icelandic names. David Felder’s music may be somewhat difficult to categorize for the average listener. Electronics are an important component, not simply as an enhancement to human players in an orchestra, but as an additional instrument: a concerto for electronics and orchestra. This idea is beautifully expressed in the opening piece, “Tweener,” where electronics and the Slee Sinfonietta combine to give a feeling of the “music of the spheres.” Vigorous oscillations across many octaves from the very high to a descent well below the baseline by the rarely heard, contra-bass clarinet, attempt to express the feeling of infinite space. “Rocket Summer” is this reviewer’s favorite piece on the CD. Written in 1979 and revised in 1983, it represents the earliest of the Felder pieces on this recording. The title of the piece is taken from the first chapter of Ray Bradbury’s Martian Chronicles, which depicts a rocket lift-off from an Ohio launch pad during a winter storm. Pianist Ian Pace sets the tone of the rocket with repeated notes and pulsating chords that build to a crescendo as the rocket prepares for lift-off. As almost a contrast, an Ohio blizzard swirls around as the rocket lifts off. Then, silence—escape velocity is reached. Looking outward at the vastness of space, the ferocity of the Ohio blizzard is but a distant memory. “Requiescat” rounds out the disc with a tribute to new music conductor/pianist James Avery. Beginning with the superb deep tones of Jean Kopperud on the contrabass clarinet, this piece surveys single notes and multiple chords with guitar accents from guitarist Magnus Andersson. The resulting swirling sounds are typically Felderian, as the focus of the piece seems to shift from one group of instruments to another until a single sound fades to black. If you can find someone with Blue Ray capability, don’t miss Rare Air. Written in 2008, the piece is in four parts and is meant to be interspersed throughout a larger program. Jean Kopperud playing clarinet and garden hose to produce sounds reminiscent of frogs, geese, and ducks is not to be missed in part 1. Part 2: Rare Air: Boxmunsdottir and part 3: Rare Air: Boxmunsson show Felder at his best, playing in the low registers with clarinet and piano doing repeated notes and octaves in a swirling pattern and colliding with electronic sounds. Part 4: Rare Air: Aria da Capo completes the collection with a short return to the serenity of nightlife beside a pond with flying insects and other night-flying creatures. This collection is a terrific introduction to a brilliant compositional career.